Chelsea Angelo is hopeful she can secure a two-year deal in the Dunlop Series with Matt White Motorsport with the view to eventually progressing Virgin Australia Supercars Championship. Angelo returned to the Supercars Dunlop Series at the Wilson Security Sandown 500, after team owner Matthew White offered her a seat in one of his Ex-Prodrive Fords. She delivered career best results in the category, taking out a tenth place finish in race two and the third fastest lap time in Sunday’s race three. 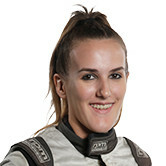 Angelo’s tenth place finish in the second-tier category makes her the first woman to achieve this since Leanne Tander in 2009. The 20-year-old will join Renee Gracie as the second female racer on the grid at the upcoming Supercheap Auto Bathurst 1000 in the Dunlop Series, October 6-9. Angelo expressed her excitement to be back on-track and have an opportunity to show her talent after missing the Castrol EDGE Townsville 400 due to budget constraints. “I’m hopeful to run in the Dunlop Series with Matt White for two years and hopefully after that if there is a seat available I can make that next step,” she said. “For now I’m just focusing on the Dunlop Series…we are all trying to work on a full season with Matt White for next year. That’s our goal.